Mikael Errasti is the owner and winemaker and he noted that his grandfather made wine for the families consumption. Back then they made field blends of whatever grapes they had and the small percentage of co-fermented red gapes often yielded Rose colored wines. There is a Rosado from Txispaz in special vintages, but it’s mostly white. No one in grandfather’s generation had any notion of wine being a commercial enterprise or that some idiot Ska fan from America would co-opt his grandsons wine and try to bring a little joy to people in America. 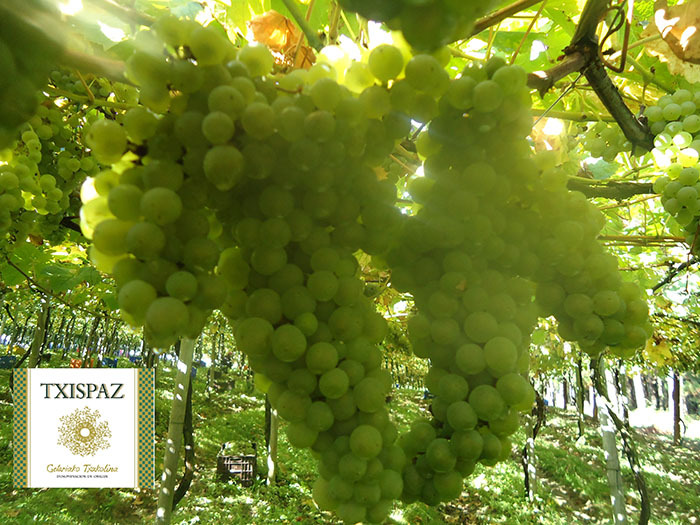 There were fewer than 25 hectares cultivated when The English Beat released Wha’ppen (1981) in the Txakoli zones. The vineyards crest over hilltops – portions facing the ocean are trellised on an Esplanade system but on the backsides one sees Parapet training to take advantage of the wind, which mitigates the wet climate. For Txispaz, everything is done by hand, except for the part done by satellites, robots and computers. The wine remains on it’s lees until February and it clarifies in tank and is bottled to order – with plenty of Chimparta! It’ best, of course, to be drunk by noon. But the wine is well balanced and well made…it’s good year round and right up until I have inventory sell of the next vintage.